Darren Morgan has been banned for 12 months by the Rhymney Valley Snooker League after refusing to compete in the singles final against Jackson Page. The 52-year-old cannot play any singles events but he can compete in doubles. Morgan says he forfeited because the final was to be on Page's practice table at Mark Williams' snooker club. This is the latest chapter in Morgan's frosty relationship with two-time world champion Williams after the two clashed during the Welsh Open in February. In a post on social media, Morgan said he was happy to play the final on "any of the other five tables" at the club, but Williams and the club refused. Rhymney Valley Snooker League confirmed Morgan has been banned from playing until this time next year but they did not comment on his claims about the table. The organisation also said Williams, who is through to the semi-final of the World Championships, was not directly involved in the decision to ban Morgan for singles events. Speaking to BBC Sport Wales, Morgan said he was "200% sure" compatriot Williams' influence ensured if he had played Page, it would have been on his opponents' practice table. "He can deny it all he wants and say what he wants," said Morgan. "I took a lot of flack at the Welsh Open when I called him a keyboard warrior and a cyber bully, but for whatever reason he has against me, he can't let up. "When he sticks something out there he has a lot of followers and he is very successful, doing unbelievable at the minute, then everyone gets on the bandwagon at my expense and he sits back and has a good laugh about it. "I'm 100% that if he did not get involved the final would have been played on another table in the club. "I'm sure Jackson Page wanted to play the final and I don't think he would have been too bothered where it was played." Can a snooker table give advantage? Morgan says his refusal to play Page on the amateur's regular table was based on making the same mistake in a tournament last year. Page, like many professionals, practises on a Star snooker table, the same quality of table used in major tournaments. However Morgan no longer uses the best quality tables at his club, having retired from the professional game in 2006, and did not believe it was fair to play an opponent "on their own table who practises six or seven hours a day". He added: "It was the same last year in the Welsh Amateur Championship. They told me I had to play the final on the practice table of the boy I was playing against. "I played on it, knew I was a million to one, and I got absolutely slaughtered, so I said I would never put myself in that position again. All finals should be at a neutral venue." Earlier this year, at the Welsh Open, Morgan was handed a wildcard invite at the expense of 16-year-old Jackson Page, a decision criticised by Williams. 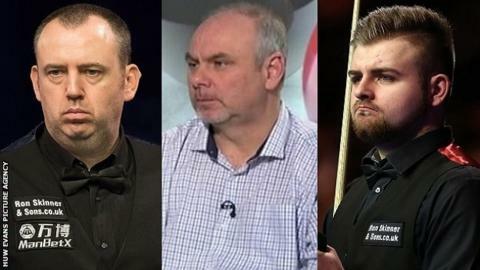 On social media, the two-time world champion described compatriot Morgan as "that fella who used to impersonate a snooker player about 30 years ago". At the time Morgan responded: "You can't fault Mark as a player, but he's a total joke, we've all blocked him on social media. "I know he's fighting Jackson's corner but he's a total joke. He's a bully. He's a keyboard warrior, but he gets away with it."